Why are you driving? 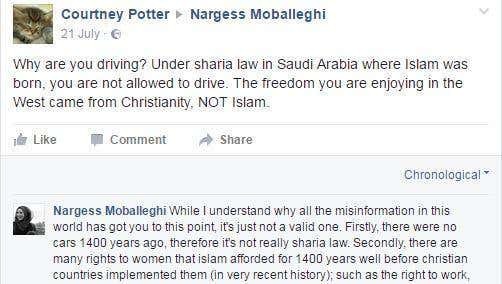 Under sharia law in Saudi Arabia where Islam was born, you are not allowed to drive. The freedom you are enjoying in the West came from Christianity, NOT Islam. Now, Moballeghi could have got angry at yet another attempt by a bigot to explain her own religion to her.